So I have been thinking that for me the best sort of blog for me would be an art blog attached to my website. Something with an RSS feed that can support comments. I have heard that WordPress is pretty good for this sort of thing and my experiences with WordPress have been slightly less user friendly but very crisp and professional. I think it’s something I could get the hang of. I think what I would like to do is try harder to document my process. Get a camera and post regular pictures of how it’s going and what is involved in making the art. I figure visual people could use some photos. And I think it could encourage me as well. The attaching a blog to my website thing seems really complicated so I still have to work though the technical mumbo-jumbo before I get too excited. Anybody planning on being in Atlanta on July 8th? I am having my residency show reception on that date and you guys are welcome to come. If you are interested shoot me a comment and I will hook your up with the details. 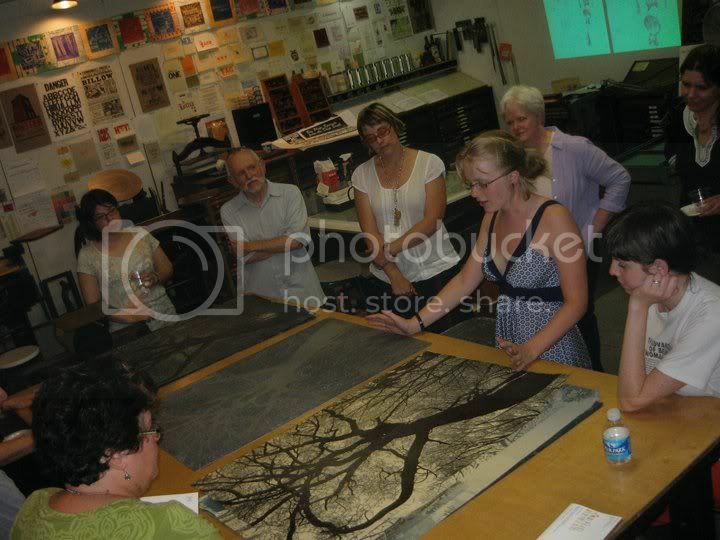 Think “crazy trees” but twice as big and twice as crazy… In fact here is a picture of us (the print and I) with some of my printmaking friends. LOL I am so tan in this picture! This was written by Hannah. Posted on Sunday, June 27, 2010, at 8:39 PM. Filed under Art. Bookmark the permalink. Follow comments here with the RSS feed. Post a comment or leave a trackback. Whoa!! You told me the size of the print on dA, but seeing it next to people really puts it in perspective! I wish I could see them in person at the reception. I guess I’ll have to stalk your blog to make up for it. SWEET! I could use a little blog stalking. I have done prints this size before, but after finishing this one I have decided to do a really really tall one. 53″x24″ I want to make something that looms over you in a gallery. I had exactly the same thought as Chelsea. Wow! I am even more impressed, if that’s possible.